This fast-paced trip crams in so much in just eight days. In the traditional Explore style it uses a range of transport and most exploration is done on foot, including walking up through the gardens in Sintra and exploring Coimbra's meandering streets. Arriving in Lisbon, we settle into our hotel and after an initial briefing with our Explore Leader, there will be the opportunity to head out for a short walk to get our measure of this remarkable place, boasting over twenty centuries of history - indeed, legend states that it was founded by Ulysses himself! Resting on seven hills overlooking the estuary of the River Tejo, Lisbon has gazed down upon centuries of change - the Phoenicians and Romans both inhabited the city, but it did not become the capital of Portugal until its conquest from the Moors in 1147. It was the hub of global trade and the heart of the maritime 'age of discovery' - boats from every nation would dock here, and riches from trade and exploration worldwide would pass by the city's harbours. Indeed, Lisbon was described as the eighth wonder of the world. Today Lisbon has all the looks of an elegant and carefully planned 18th century city. Today we take a metro to Lisbon's Rossio Station for the short train ride to the hills and palaces of Sintra - inspiration to poets, artists and travellers alike. Lord Byron claimed the village of Sintra 'perhaps in every aspect the most delightful in Europe; it contains beauties of every description… palaces and gardens rising in the midst of rocks, cataracts and precipices; convents on stupendous heights, a distant view of the sea and the Tagus'. The air is noticeably cooler and the views dramatic. We walk for two hours between the ornate palaces and marvellous manor houses that sit amongst the lush and ornate vegetation in this stunning setting. There will be time whilst here for you to have the option to visit either visit King Ferdinand II's very creative and colourful Pena Palace or the Quinta Regaleira with its ornate Gothic facade and enchanting gardens. We'll also have time for a picnic lunch before we return to Lisbon in the late afternoon. Our morning walking tour takes us through the different bairros (districts) of the town, and those we are unable to visit can be explored later during our free time this afternoon. Old trams negotiate the undulations of Lisbon's cobbled streets, and the varied and interesting buildings throughout the city never fail to impress, both architecturally or for the history they contain. We walk up Alfama Hill where there is time to nip into local neighbourhood shops for a snack. In the course of the day your Explore Leader will also find a place to try Ginjinha, a very local liqueur made from sour cherries, which is an acquired taste. This afternoon there is the opportunityt to jump on a local ferry across the Tejo River to Casilhas which has a working port feel and excellent views back across to Lisbon proper. Here you can sample a traditional slow paced fish lunch (vegetarian options are available) near the docks before returning to the city at around 14.00. The rest of the afternoon is free to explore, particular highlights are the churches and Se de Lisboa Cathedral, as well as the galleries and museums which offer insights into the art, history and society of Portugal. The Baixa District is well worth a visit and is linked to the equally interesting Bairro Alto by a 32 metre wrought iron lift named Elevador de Santa Justa. Tram 15 along the waterfront takes you to Belem where you'll find the Discoveries Monument - remember that Lisbon was the centre of the age of discovery, and the starting point for many early explorers' great voyages around the world including Vasco de Gama. You may also choose to visit the 500 year old Jeronimos Monastery and the Tower of Belem, whilst here. This evening you'll have the opportunity to experience a live performance of 'Fado' music. Stemming from the word 'fate', the music of Fado can be deeply personal in its expression. Said to have been born from the songs of African slaves, the sentiments behind this soulful music are deeply linked to the heritage and hearts of the people, and as such is quintessentially Portuguese. Enjoying this performance after dinner (at around 22.30) we come a little closer to feeling a sense of 'saudade', a sentiment of nostalgia which, it is said, that only the Portuguese truly understand. This morning we leave Lisbon and drive to Alcobaca, a gem of a small medieval town in the centre of the country featuring one of Iberia's great monasteries. Hiding behind the imposing Baroque facade is an austere monastery with a forest of unadorned 12th century arches. But make sure you visit the rest too: the atmospheric refectory, vast dormitory and other spaces bring back the Cistercian life, which, according to sources, wasn't quite as austere here as it should have been. After some free time for strolling around we continue to Batalha. We take time to see its splendid Gothic monastery, Mosteiro de Santa Maria da Vitoria, built to commemorate the Battle of Aljubarrota, which was fought just south of here. The construction of the monastery was never fully completed and we'll see the unfinished chapels. In the evening we reach the old university town of Coimbra. Although it has a beautiful historic centre it also has one foot firmly planted in the present. It has an attractive modern riverside park and is home to a large university. Our Explore Leader will take us on a walk through the backstreets of this little known town. This morning we have a couple of hours free in Coimbra, which was once the medieval capital of Portugal and sits on a hillside rising from the River Mondego. You may like to visit the university area with its startling collection of centuries old buildings and its famous library. Later this morning we will drive into the Douro Valley to Lamego. This picturesque Baroque city is nestled among the terraces of the wine growing region of the Douro Valley. After free time here for lunch we will continue to Peso da Regua where we have a wine tasting at a local vineyard before checking in to our hotel for the evening. This afternoon there will also be the opportunity to join a boat trip from Pinhao for around one hour along the Douro River to take in the views along the valley with its vineyards set on terraced hillsides. This morning we take the train to Porto and on arrival our Explore Leader will take us on an orientation walk. We'll stroll down the cobbled streets to Cais da Ribeira - undoubtedly the most picturesque spot. This characterful quayside is dominated by the tall outline of the two tiered Dom Luis I Bridge, built in 1886 by an assistant of Gustave Eiffel. Here, ancient houses with laundry-draped balconies stand high above the waterfront looking out over the river, where several old boats lie moored at the water's edge. Despite the decline in the use of this harbour, with its fish market and restaurants, it continues to have character and bustle reminiscent of its lively past. Following our tour we include a visit to a port lodge. The history and processes involved in making these white, ruby and tawny delicacies are most interesting, and we'll get to enjoy a port tasting. The rest of the day is then free to further explore the city that has a surprise around every corner - churches clad in finely illustrated blue and white azulejo tiles; bustling food markets selling everything from fruit and vegetables, to bacalhau (traditional salted cod), fresh chickens' feet and tripe; and peaceful squares with small friendly coffee bars hidden away, where you could sit back and watch the world go by. This evening you might like to visit the nearby city of Matosinhos where you can sample a barbequed fish dinner on the seafront. Today is free for you to further discover Porto. There are a number of fascinating buildings to visit whilst walking in the heart of the city. You may choose to climb the tower of the 18th century Baroque Igreja dos Clerigos, which affords superb views across the city or see the Palacio da Bolsa - built to house Porto's stock exchange. The interior design is outstanding - particularly the building's Arabian room, inspired by Granada's Alhambra Palace. You may consider venturing further afield and taking the train or a local bus the short distance to the attractive towns of Guimaraes or Braga. Our trip ends at our hotel in Porto after breakfast. Fado concert in the Baixa District €5.00. Visit to Belem by tram €1.50 per way; Jeronimos Monastery and the Tower of Belem combined ticket €12.00. Douro River boat trip (approximately 50 minutes duration) €10.00 per person. Transport €70.00 per group. 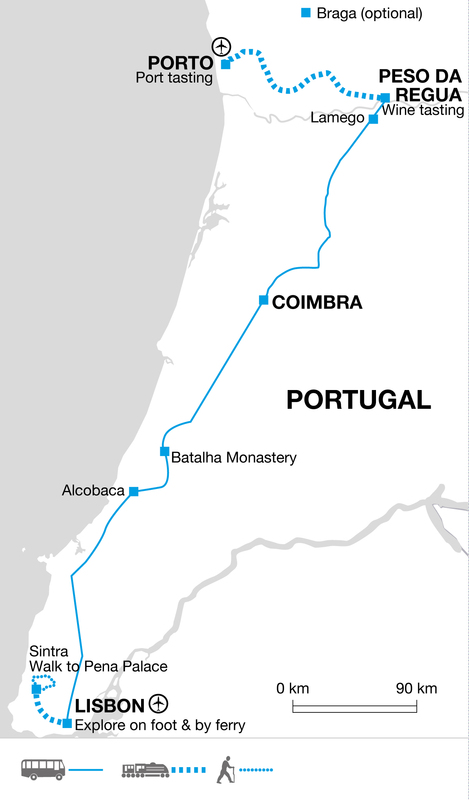 Guimaraes by train €14.00 (journey time is approximately 1 hour 15) or Braga by train €11.00 (journey time is approximately 1 hour). Dinner in Matasinhos approximately €20.00 plus transport by metro approximately €1.20 per way. Lightweight cotton clothing is best from June to September, light rainwear may be needed at any time of year, but especially after the start of September, and a warm fleece/light jacket is recommended for cooler evenings. Walking shoes or boots are strongly recommended for the walks in the countryside and in the towns, ideally waterproof just in case. One main piece of luggage and a daypack. We recommend a bag you are happy to wheel and lift as we use a variety of public transport and taxis on this tour. A daypack is essential for the walks in the towns and countryside. Remember you are expected to carry your own baggage - so don't overload yourself. During the summer months we recommend you bring a sunhat, sunglasses and sunscreen. A water bottle is recommended. Although entirely voluntary, tipping is a recognized part of life in this region of the world. Some local staff will look to members of the group for personal recognition of particular services provided. Accordingly please allow £15.00 for tipping. In order to make things easier for you, the Explore Leader may organise a group's tips kitty and if this is the case, they will account for it throughout the tour. This trip is designed to acquaint you with the highlights of Portugal in just 8 days. We make the most of our time by using a mix of public transport and charter buses to travel between the cities and in order for you to experience the journey like the locals do. Once we're in the cities our explorations are mostly done on foot, the terrain can be hilly and uneven so please bring sensible footwear and be prepared for the busy nature of this enthralling holiday. On this trip get an introduction to Portugal in just eight days. From the centuries of history and trams in Lisbon to the rolling Mediterranean hills and landscapes, traditional music to wine tastings, this varied and fast paced trip has much to offer.